Tim was the only occupant in his SUV and was wearing his seat belt when his SUV (heading north above Columbia Falls, Montana to a cabin – near Glacier National Park) was hit head on by a truck that crossed over and struck the SUV on a viaduct. Alcohol and speed were factors in the accident. The other driver has been charged with motor vehicular homicide, and is awaiting trial. Many really-nice comments in regard to Tim’s diligence and interest in his patients can be seen if you Google the obituary, etc. from the Omaha newspaper. Tim was predeceased by his mother Jeanne and two granddaughters. Along with Ann and Tim’s father, Tim is survived by a son, three daughters, 10 grandchildren, 3 brothers and 3 sisters. Cape Elizabeth, Me, 10/29/15—Dorothy Lindsay Brady, aged 102, died peacefully, surrounded by her seven children and several of their spouses. She had been in good health, physically and mentally before suffering a stroke approximately a week before her death. Dorothy Elizabeth Lindsay was born in 1913 in Lindsay, Oklahoma. She was born in a town named after her father, and in a house built in the 1870’s by her maternal grandparents in what was then the Oklahoma Indian Territory. They were of Choctaw heritage. Dorothy was a member of the Choctaw Nation. Her parents, Lewis Edward Lindsay and Anita Murray Lindsay, met and married when he visited the Murray ranch as a cowboy on a cattle drive from his native Texas. Dorothy’s father taught her to read before she began her schooling in a one-room schoolhouse in Erin Springs, Ok., adjacent to Lindsay. She attended the Lindsay schools and then graduated from a convent high school. She went to Oklahoma Women’s College, Chicasaw, Ok. for two years, following which she attended and graduated from the University of Oklahoma, Norman, Ok. Afterwards she did graduate work at the Peter Bent Brigham Hospital in Boston, MA, graduating as a dietician. With the onset of World War II, she volunteered for the U.S. Public Health Service. As a child, Dorothy studied piano and the cello. She also was an active athlete, playing tennis and riding horses. She met her future husband, Dr. Francis “Bud” Brady, on the tennis courts at the Public Health Service Hospital in Baltimore, Md. They were married in Fort St. John, British Columbia, in 1942, after Dr. Brady, an Army dentist, was deployed to serve the troops building the Alaskan Highway. During World War II, they lived briefly in Alameda, CA, where their first child was born. She then moved back to Oklahoma when he was redeployed to the U.S. Navy in the South Pacific. Following the war, they moved to Titusville, Pa, “Bud’s” hometown. He developed a thriving dental practice and together they raised their seven children, Anita, Mary Ellen, Robert, John, Michael, Lewis, and Lisa. Dorothy was a force in her children’s lives. She taught each of them to ride a bike. She made sure each knew how to swim. She insisted they take music lessons. She monitored their academic progress and social lives. She made their Halloween costumes. She made sure they enrolled in “good” colleges. As they married and her 17 grandchildren and 12 great grandchildren arrived, she took on the same role for the succeeding generations. Even as she mothered her large family, Dorothy continued to have an active life. She played tennis and golf. She enjoyed bridge and other card games. She was an active member of the Titusville Women’s Club and the PTAs of her children’s schools. She read widely and maintained a life-long commitment to the liberal tenets of the Democratic Party. Following her husband’s retirement in 1980, they began to spend the winters and eventually re-located to Ft. Myers, FL, where they enjoyed playing golf and bridge, and had an active social life. They traveled widely, to Europe, the Middle East, Asia, and Central America. Dorothy constantly entertained members of her family. All of the grandchildren have fond memories of driving their grandmother’s golf cart, visiting the orange juice store, and going to Ft. Myers Beach. She took many of them to Disneyworld and made sure that each of them had the opportunity to enjoy Deer Hill Camp in Durango, Co. Bud died in 2009, and Dorothy re-located to Village Crossing Assisted Living, Cape Elizabeth, Me, in 2011, to be near her daughter Lisa. Dorothy was grateful to Lisa, and her husband, Russ, for their unstinting help while she lived at Village Crossing. Dorothy is survived by her three sons-in-law, Dean Jensen (Mary Ellen), Jeff O’Sullivan (Anita), and Russ Leonard (Lisa), and three of her four daughters-in-law, Roberta Isleib (John), Jane (Mike), and Pat (Lewis). Bob’s wife, Margaret, died earlier this year. She is also survived by 17 grandchildren and 12 great grandchildren. Donations may be made to the Lindsay-Murray Mansion, c/o Lindsay Historical Society, Lindsay, OK. Benson Memorial Library or St. Titus Church, Titusville, Pa., or Cape Elizabeth Library, Cape Elizabeth, Me., or Gosnell Memorial Hospice House, Scarborough, ME. Pat Misch didn’t pull a Don Larsen, but he came pretty damn close. 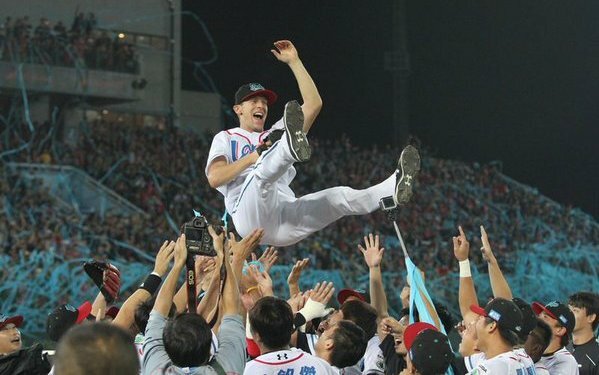 Sunday night in Taiwan, Misch threw a no-hitter in Game 7 of the Taiwan Series to clinch the Chinese Professional Baseball League championship for the Lamingo Monkeys. It was the first no-hitter in Taiwan Series history. The Monkeys beat the Chinatrust Brothers 11-0 in the decisive Game 7. Monkeys’ starter Misch came close to pitching a perfect game, the only blemish to his just over 100 pitch game being a walk to Brothers first baseman Peng Cheng-min in the fifth. He threw a complete game, striking out seven batters, limiting the opposing team to 24 at bats in the game, while the Brothers expended six pitchers after Chiu was relieved. Teammates swarmed the hero after the last Brothers hitter was thrown out at first, as the home field crowd’s cheers crescendoed euphorically. Misch’s no-hitter was the first ever in the Taiwan Series. Misch, 34, spent the 2006-11 seasons as an up and down arm with the Giants and Mets. He posted a 4.80 ERA (89 ERA+) in 200 2/3 big league innings spanning 24 starts and 54 relief appearances. Misch spent the 2013-14 seasons in Triple A and an independent league. The Marlins signed Misch to a minor league contract last offseason. He didn’t make the team out of spring training and instead reported to Triple A, where he went 5-7 with a 3.25 ERA in 72 innings. Misch was released in July and spent a month in an independent league before getting an opportunity in Taiwan. I have to say, throwing a no-hitter in Game 7 to clinch a championship is pretty much the coolest thing ever. That’s something every pitcher dreams about as a kid. Congrats to Misch and the Monkeys.